(Hewitt) Henry Rayner (1902-1957) arrived in England in 1923 at the age of 21, and stayed for the rest of his life. He wasn't the first (or the last) Australian artist to enjoy living and working in London, but what makes his story special is that apart from one very short visit to Melbourne in 1931, he never returned home. It was in England that he received his formal art training (at London's Royal Academy of Art). Here that he developed his career as an artist. Here that he married and started a family. And here that he died. He was first and foremost a drypoint etcher. He saw himself as a ‘people’s artist’, making prints that would be affordable by ordinary people. His preferred subjects were ordinary people and ordinary places - especially London riverside scenes. When he wasn't drawing and etching, he was jotting down notes about the artists and writers he met, and about his own life. Rayner was a student of Walter Sickert at the Royal Academy Schools in 1925-6, and this relationship evolved into a genuine friendship. They met regularly until Sickert moved to Bath in 1934. Rayner wrote extensively about the things Sickert said and did, both in the classroom and at private meetings. These manuscripts remained unpublished, but have survived. They not only tell the story of Rayner's life and work, but provide unique insights into London's art world of the 1920s and 1930s. Having decided to concentrate on drypoint etching as his preferred medium, Rayner stuck to it right through the 1930s, even though etchings had by then dropped out of fashion. His output of 500+ original plates between 1925 and 1945 makes him quite possibly the mid 20th century's most prolific drypoint etcher. Although he has been more or less forgotten since his untimely death at the age of 55, there are many institutions that hold examples of Rayner's prints. These include the V&A, the British Museum, the National Portrait Gallery and the Royal Collection, as well as major galleries in Australia and New Zealand. A large collection of his manuscripts, notebooks, correspondence and pictures was discovered a few years ago in a goat shed in Lincolnshire. From this material, together with original research in the UK and Australia, the story of Henry Rayner can be told for the first time. The oil painting by Henry Rayner dates from his days at the Royal Academy Schools, and was most probably done in 1926. It's interesting from several perspectives. The tall blond-haired figure with the red-and-white scarf is almost certainly a self-portrait. The waitress is based on his wife-to-be, Theresa Zecchin. The character with the white beard is based on a figure from a well-known painting by Walter Sickert 'The old fool' from 1922. 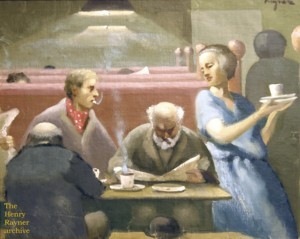 The painting is set in one of the Chelsea cafe/restaurants that Rayner frequented, probably either the Old Lombard Cafe, the Good Intent, the Blue Cockatoo or the Cheyne Buttery. Image reproduced courtesy of Sheilagh Wilford. New: There is a regular Twitter feed about Henry Rayner. See here: Twitter. © All content of this website copyright Roger Staton, 2015.